The Visual Monitoring Camera (VMC) is mounted on Mars Express, ESA's deep-space probe now orbiting the Red Planet. It originally provided simple, low-tech photos of the Beagle lander separation, and is now back in action as the 'Mars Webcam'. It's not a scientific instrument, but it does provide fantastic images of Mars - including crescent views of the planet not obtainable from Earth. Mars Express has been in orbit around Mars since December 2003. The mission comprised two spacecraft – the Mars Express orbiter and the Beagle 2 lander. To verify the correct separation and trajectory of the lander, the VMC (Visual Monitoring Camera) - a basic optical monitoring camera - was installed on the orbiter to image the retreating Beagle, which was successfully done in December 2003 (unfortunately, Beagle was later declared lost). This was the only use of the VMC camera prior to 2007. Beagle 2 during separation, 19 December 2003: The bright spot on the left-hand side of this picture is the back side of Beagle 2, slowly drifting away from Mars Express. This image, taken 9:33 CET, 19 December 2003, shows the Beagle 2 lander when it was about 20 metres away from Mars Express, enroute to a surface landing on Mars. Beagle 2 was subsequently lost (Credits: ESA). It seemed somehow inappropriate that the photographic capabilities of the VMC - an excellent, if modest, camera - should remain forever dormant. Due to the camera's unique location, it could, for example, capture crescent images of Mars that are not obtainable from Earth. VMC's wide field of view also provides global images of Mars - something that is not currently provided by any other spacecraft. In 2007, the Mars Express Flight Control Team based at ESA's European Space Operations Centre (ESOC), Darmstadt, Germany, began a test campaign to see whether the camera could be used to image Mars. It wasn't even known if the camera would function at all after over three years of inactivity in deep space. But the VMC did, indeed, come back to life and the results to date have been very encouraging. Throughout 2007, the team ran a test campaign to verify the camera's capabilities, followed by fine-tuning to find the optimal parameters for Mars imaging. The task was made more challenging due to long periods, particularly during eclipse season, when on-board memory, downlink slots or command uplink time weren't available due to higher priority demands. Photograph of the VMC's IRIS-1 system. 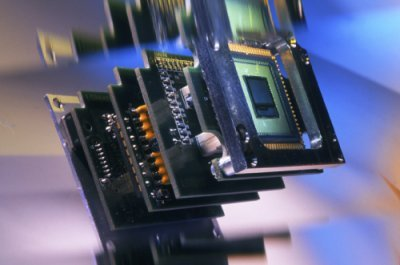 This shows the IRIS-1 "camera on a chip" system and power support internals of the VMC camera before application of the housing (Credits: ESA). October and November 2007 saw the first regular operations, with observations occurring approximately every three days. VMC observations are now routinely inserted into the Mars Express planning cycle, on a strict non-interference, time-available basis with respect to formal payload activities. VMC activities are unique in that the camera is operated by the Flight Control Team, and not a team of scientists. This gives operations engineers, particularly junior members, a chance to learn and practise command generation, planning, and other skills normally done at the Science Operations Centre. 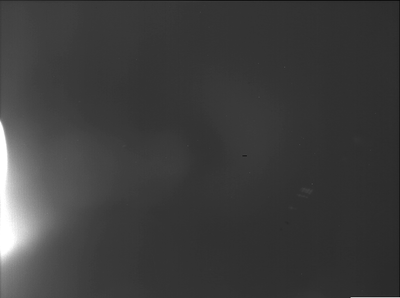 Mars Express 07-028 21.48.52 VMC Img No 27.png: Unfortunately, due to a coordinate error defining the attitude of the spacecraft, we pointed 38 degrees in the wrong direction! 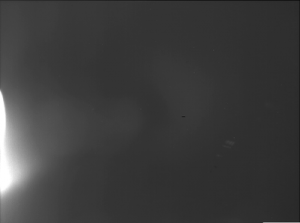 Luckily VMC has a 40 degree FOV (field of view), so we caught a sliver of Mars on the edge of the image, proving that after 3 years of hibernation without being switched on VMC was still operational and could indeed image the planet it is orbiting. Exposure time: 9ms (Credits: ESA). To be sure, many of the early photos returned from the VMC showed only the inky blackness of space; the humble camera's resolution is too low to show even any interesting stars and it has no pointing control (other than to rotate the spacecraft itself). Also, there is no focus adjustment and only basic exposure controls, so many images have come back blurry and greatly over- or under-exposed. Nonetheless, the team persevered and, through trial-and-error as well as lots of self-taught research, have learnt how to operate the camera to at least some good effect - good enough, finally, that the image sets can be shared via the Web. In the future, images from the VMC - nicknamed the 'Mars Webcam' - will be made available online as soon as possible and whenever we have something worth showing - and on the understanding that the VMC project is strictly a low-priority, "as available" activity. The Mars Express team hopes that you'll enjoy these images - and furthermore, we need your help! You can assist the Mars Express team with additional processing of the raw image data files as well as interpretation: What do you see? What part of the Mars surface is being shown? Can you identify any geographical features? What regions of the atmosphere or atmospheric components do you see? We would be delighted to receive copies of any good results that you get - either processed images or interpretations (see 'Submit your pics' for details) - and we hope you'll allow us to publish the best submissions. A diagramme showing the VMC's field of view and mounting location on the top of Mars Express. As can be seen, the camera is located very close to where Beagle was attached such that the lander filled almost the entire field of view prior to release (Credits: ESA). The 'Mars Webcam' provides a visual connection to what we do here on ESA's operations teams every day of the year - it's a chance for us to share our passion for space! VMC images are just simple photos gathered by one ordinary camera - but it's a camera mounted on a spacecraft orbiting one of the solar system's most exciting planets, millions of km from home!